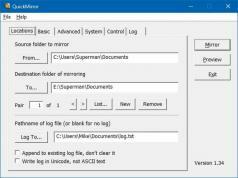 QuickMirror is a practical Windows file management tool that lets you convert destination folders into mirror images of source folders, but also provides backup and synchronization capabilities. The program offers both essential and advanced options to customize mirroring. Also, it can log all mirroring actions for later analysis. You can use the preview command to test mirroring options on source and destination folders. If you use it with logging you will be able to see the results of mirroring before performing it.